Heart determination consists of induction events and inhibition events as prospective heart mesoderm encounters adjacent or near-by tissues in the changing embryo. Stain marks on embryos are used to indentify the portion of the mesoderm that will normally form heart in the future, that is, the prospective heart mesoderm. Explant, defect, and recombination experiments may be used to ask when is the heart determined and what other tissues does the heart mesoderm interact with that affect heart determination. 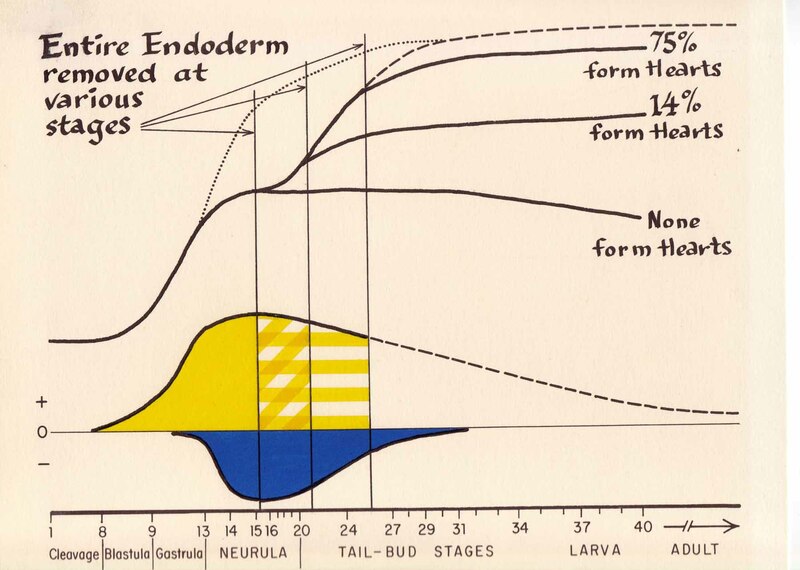 J. Holtfreter (1938) found the two heart rudiments in the salamander gastrula to be among the cells of prospective head mesoderm that are first to move craniad. The heart cells are next to future stomach-esophagus endoderm (foregut endoderm), which also moves craniad during gastrulation. While induction events may be occurring during gastrulation, these early future heart cells would be difficult to experiment with. 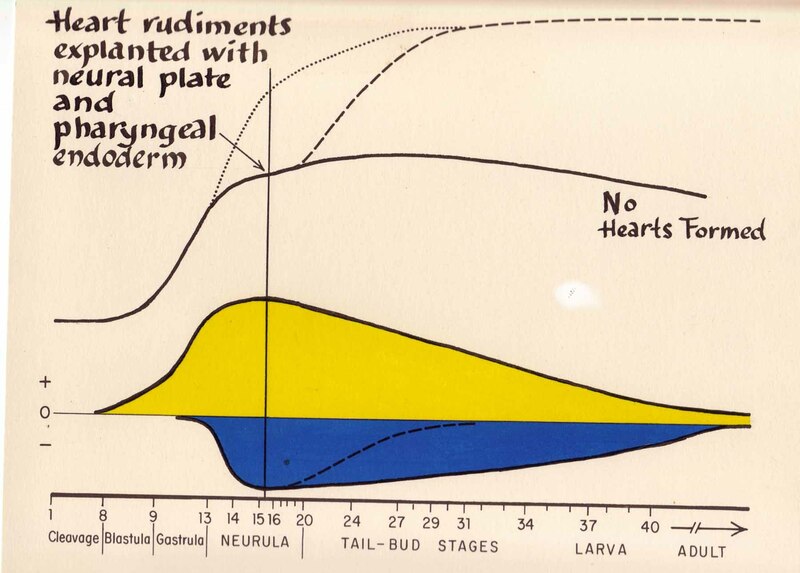 S. Wilens (1955,1959) located the heart rudiments at open-neural-plate stages in the salamander embryo. 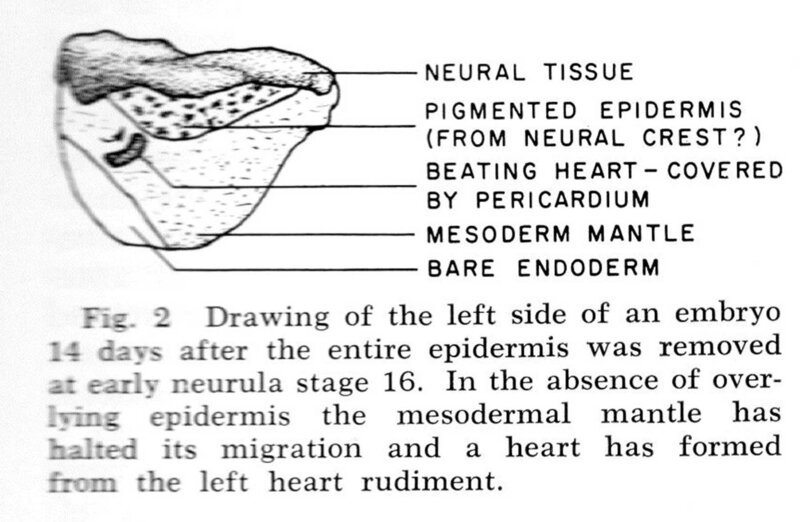 The right and left heart rudiments are at the most anterior-dorsal edges of the lateral plate mesoderm. These cells are readily experimented with. Presumptive heart mesoderm lies next to future foregut parts (esophagus and stomach), in the gastrula fate map of Holtfreter, and lie above the same foregut parts in the open-neural-plate stage fate map of Wilens. After the open-plate stage, the heart rudiments migrate to the ventral midline beneath endoderm of the future liver and pharynx floor and the right and left heart rudiments unite to form the single heart. 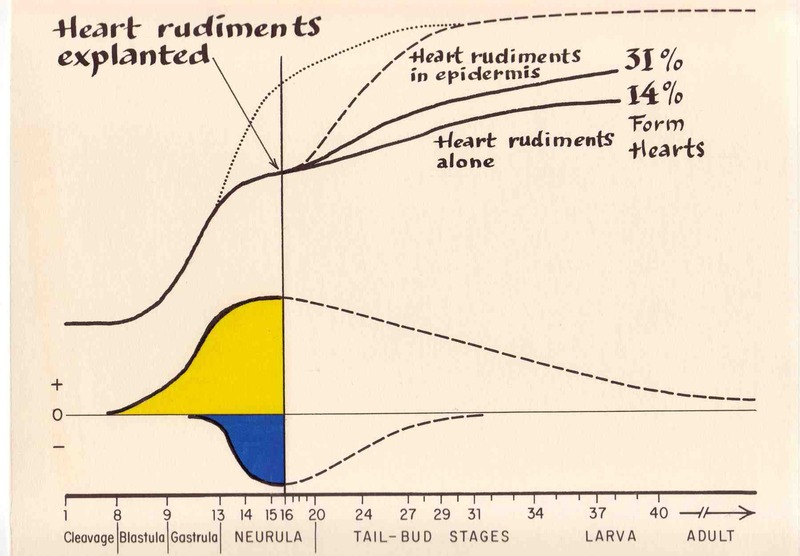 Many experiments have defined the normal course of heart determination as shown on the graph. Such experiments will now be illustrated. The first experiment is to define the state of heart determination in the open-neural plate stage. In the experiments above, "heart rudiments" consisted of fused rudiments from both right and left sides. Enclosing epidermis came from various sites with no differences in results except left epidermis produces beating hearts sooner than right epidermis does. These issues are discussed in Jacobson, 1961. An epidermal vesicle, which shields the heart rudiments from the saline solution, provides a better site for heart to form, and also provides a surface on which heart attaches. 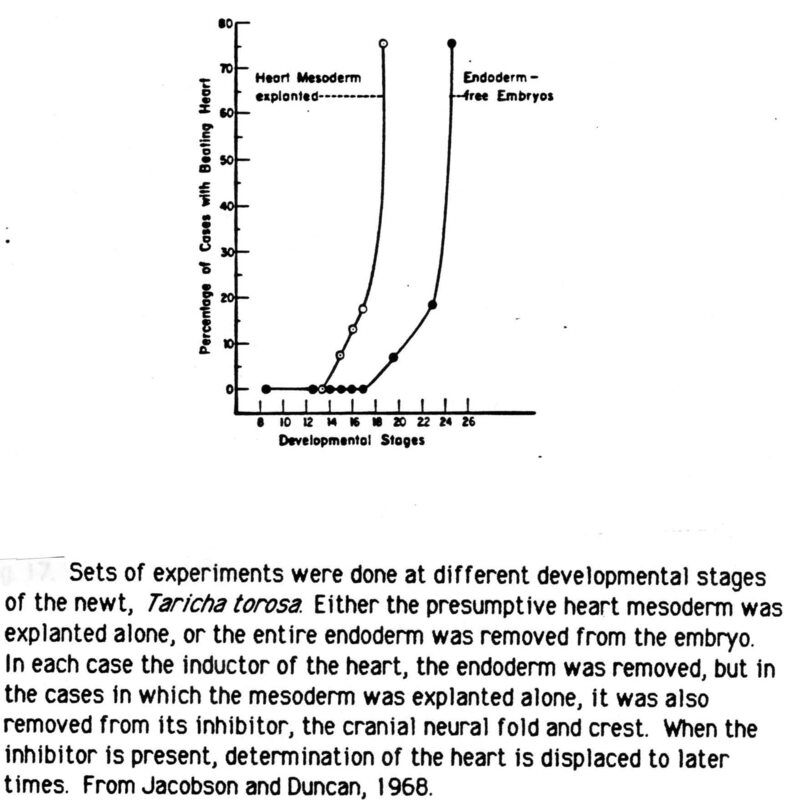 The following experiment suggests that it is unlikely that the epidermis is essential to heart formation. The following experiment combines heart rudiments with its putative inductor of underlying endoderm, encased in a vesicle of overlying epidermis. When the inhibitor (neural plate) is combined with heart rudiments and endoderm in a vesicle of epidermis, the heart mesoderm is forced to continue to be close to the neural plate. The result is no hearts form. 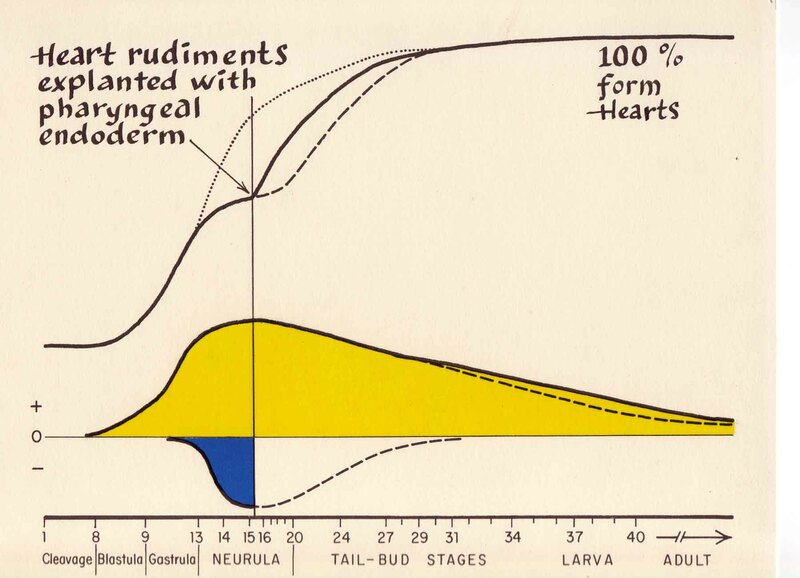 When the entire endoderm was removed at different stages, the longer the inducing endoderm was present, the more often hearts were formed. 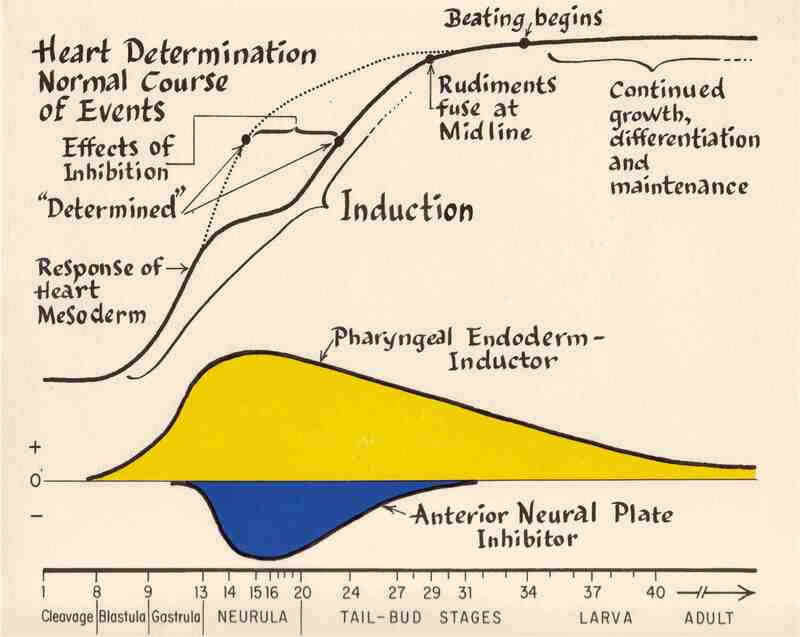 Jacobson (1961) did a number of experiments that suggested heart inhibition capabilities in both the neural plate and the neural folds. Anterior neural plate and folds are more inhibitory than posterior plate and folds. The effects of the presence of the inhibitors is to displace heart formation to a later time. Three variables were seen in the results of these experiments. They were a.The percentages of cases that responded. b.The average times it took to respond after the experiment began. c. The quality of the responses. We have interpreted the meaning of "percentage response" from studies of several induction systems. First, the percent response from a set of experiments is the same within plus or minus one percentage point the next year in an identical set of experiments under the same conditions. Some amount of induction produces a distributed population in a normal curve because of biological variation. 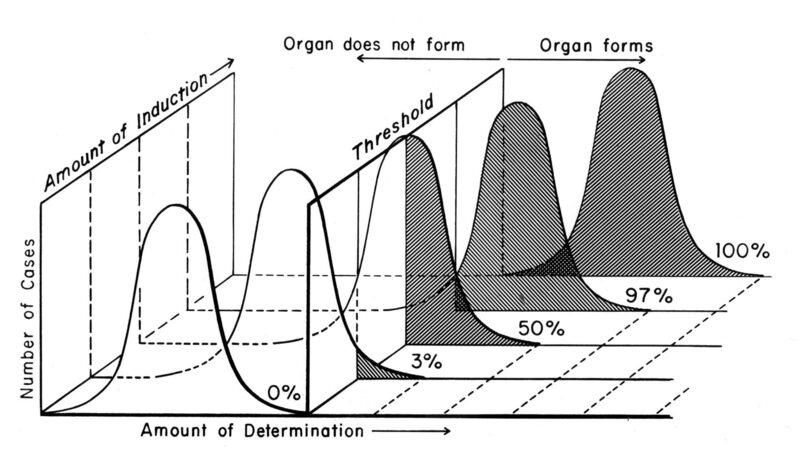 No individuals within that population, or some or all of the individuals, may have passed a threshold of determination and produced the organ. As a distributed population passes through the threshold, there is a non-linear response to the amount of induction. 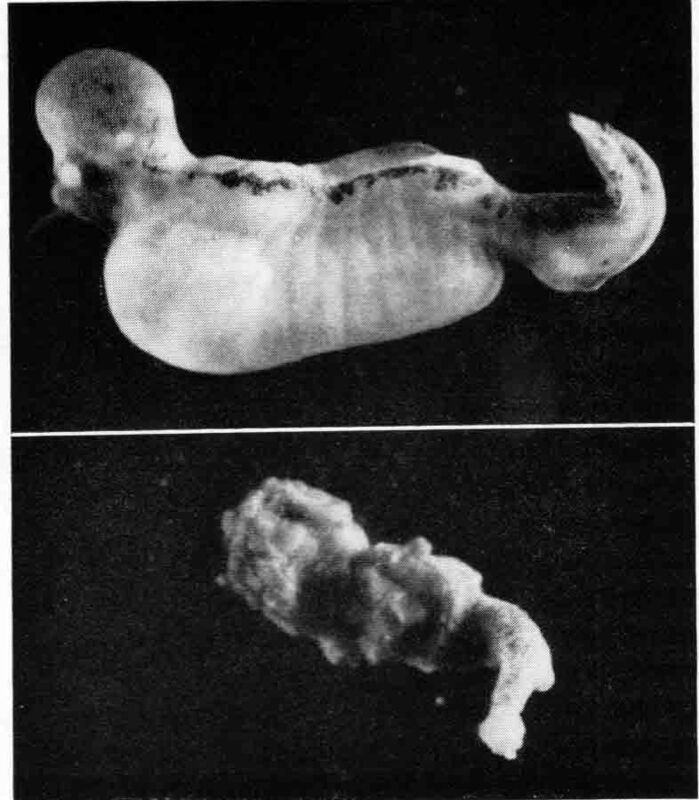 The illustration below (from Jacobson and Sater, (1988), Features of Embryonic Induction, Development 104:341-359.) shows this concept. It is worth noting that some induction may have occurred, but no individual case may have crossed the threshold. The second variable, the timing of response, depends in part on the presence or absence of inhibition. Our heart experiments began in mid-neurula stages. In normal embryos, the heart begins to beat at stage 34, which occurs on the seventh day after mid-neurula stage. The issue of timing will be discussed further in the secton that follows. The third variable, that of the quality of the response will also be discussed below. The studies of heart induction using tissue recombinations found two independent variables, namely, proportion of cases to respond with heart formation and timing of that response (how long it took to respond). A third variable was the quality of the responses, which ranged from formation of a pulsing tubular heart, similar to the normal early heart, to the beating of just a few isolated heart cells. In a series of cases in which heart mesoderm was encased in epidermal vesicles, the best-formed hearts were in explants that also contained anterior dorso-lateral endoderm, the next best in vesicles with ventral final-heart-site endoderm, and the most poorly formed were in vesicles with posterior endoderm. Jim Duncan and I wished to test fractions of homogenates from inductor and inhibitor tissues (Jacobson and Duncan, J.Exp.Zool. (1968) 167:79-103). We made two changes in the culture techniques. In order to use small volumes of culture medium, we shifted to a hanging drop culture method as described by Twitty (1945) (J. Exp.Zool. 100:141-178). We also changed from using Holtfreter's salt solution as the culture medium and used instead Niu-Twitty solution which supported heart formation in hanging drops. The compositions of these two buffered salt solutions are shown in Table 1, page 87 of Jacobson and Duncan (1968). In an attempt to obtain an active heart inductor fraction from homogenized anterior dorso-lateral endoderm (the heart inductor tissue), I did some preliminary experiments in which I centrifuged the homogenate. I found that there was an active fraction at the aqueous-lipid boundary. This suggested that the inductor substance may be membrane-attached or associated. We decided to prepare a tissue fraction in which some membranes are preserved. A gel filtration method of preparing 'membrane' fractions from homogenized Neurospora mycelia using a Sephadex column (Wagner et al., 1967. See ref. in Jacobson and Duncan, 1968) was successful. After preparing a Sephadex G-100 column with distilled water and autoclaving, the water was replaced with Niu-Twitty solution and 1 ml of tissue homogenate pipetted on top. A flow of Niu-Twitty solution slowly flushed the preparation through the column. The active fraction was found at the advancing boundary of the first visible homogenate material to pass down the column. There is a sharp spike of activity as the boundary drops from the column, and lesser spikes were in drops that preceded and followed the boundary. Material that followed a short distance behind the boundary was not active, and instead lysed the cells being tested within 24 hours. Boundary material did not lyse cells. We examined each hanging drop for evidence of beating each week for a month, so the time of first beating became apparent. The results with many combinations of presumptive heart mesoderm in hanging drops with membrane fractions, with putative inductor tissues or suppressor tissues, and with combinations of membrane fractions and these tissues, were complex and described in detail in Jacobson and Duncan, 1968. We concluded that there are three different factors in heart determination. There is in the anterior endoderm a specific heart inductor substance that increases the percentage of cases that form hearts and, more importantly, speeds heart formation. There is in a number of tissues, but especially in epidermis, a general stimulatory factor that increases the frequency of formation of beating heart tissue in cultures, but does not hasten heart formation. In cranial neural fold, and in adjacent neural plate, there is an inhibitory or suppressor agent that persists for a limited time and delays or prevents heart formation. Stimulatory and speeding factors persist after freezing or boiling, and can remain active after being kept at 10 degrees C. for a year. The suppressor agent is labile. Regions of the endoderm are labeled 1-7. Each region was tested in hanging drops with heart mesoderm from stage 14+ embryos. PHM is the presumptive heart mesoderm, and MM, which does not normally form heart, is the mesoderm just posterior to the PHM. PHM was put in hanging drops with the various regions of endoderm labeled 1-7. Underlying endoderm (2) speeded heart formation considerably and endoderm from region 6 also speeded formation to a small extent. 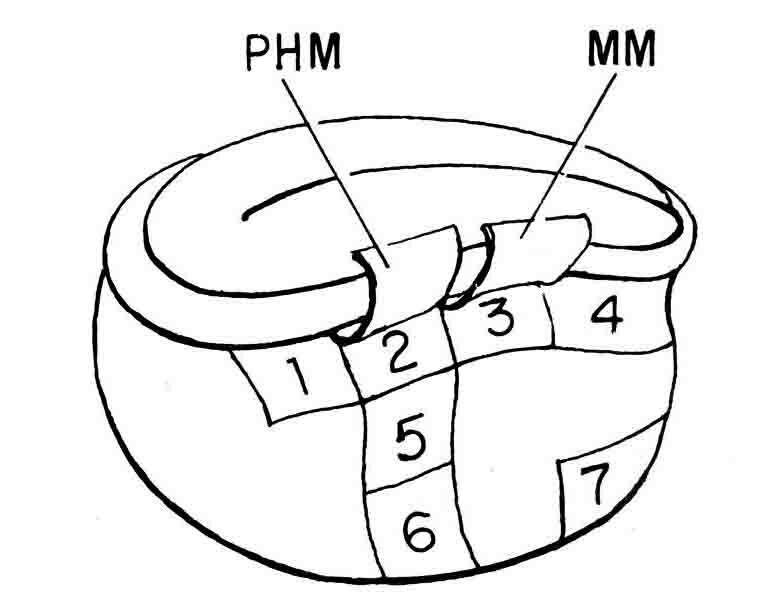 The mid-ventral site to which heart rudiments eventually migrate is labeled 6. No other region of endoderm speeded heart formation, and posterior endoderm slowed heart formation. Region 1 increased considerably the percent of cases that formed heart, but did not change the speed of formation. Endodermal regions 5 and 3 increased but did not speed heart formation. Region 7 decreased heart formation. MM isolated with region 2 was speeded some to form heart. MM from stage 14+ rarely (3%) formed heart, but when isolated from stage 15 embryos, MM formed hearts more frequently (37%), but did so more slowly. The speeding factor in region 2 is necessary in normal heart formation. The general stimulatory factor found in other tissues may cause some hearts to form in mesoderm, such as MM when isolated in culture, but, to quote Fullilove, "in the normal embryo some other fate overtakes this mesoderm before it gets a chance to contribute to heart formation." Endoderm is a principal inductor tissue of a number of organs besides the heart. These include the limbs and the mesonephric kidney. The principal heart inductor is localized in anterior dorso-lateral endoderm. Inductors of other organs are localized in other sites in the endoderm. A set of experiments from Jacobson and Duncan (1968) illustrates what happens when these different inductors are mixed. Whole endoderms from five stage 15 neurulae were cultured in Niu-Twitty solution for 15 days, then the conditioned medium was drawn off and gelled in gelatin. Shaped pieces of the gel were placed in endoderm-free stage 15 embryos. The result was the prune-like embryo shown in the lower part of the figure. An endoderm-free embryo with no replacement is in the top of the figure. The embryo seems much confused when all the cells are exposed to a mixture of several inductor substances. When the endoderm is removed from a stage 15 embryo, and replaced with a piece of gelled conditioned medium made by cultured pieces of anterior endoderm, the result appears much like the top figure and a beating heart forms. If replaced by a piece of gelled conditioned medium from posterior endoderm, the end result appears much like the top figure, but does not form heart. It is interesting that when a piece of anterior endoderm is dropped into the cavity made by removing the entire endoderm, the anterior endoderm somehow finds its way to the anterior end of the cavity and a heart forms. If a posterior piece of endoderm is dropped into the cavity, it finds its way to the posterior end. Epidermis and/or mesoderm must provide guidance to the endoderm cells. Urodeles such as the newt are slow developers. Some other amphibia, such as the South African frog Xenopus laevis are fast developers. Most laboratories select fast developers. The development seen in a newt embryo in a week takes but a day in Xenopus. Amy Sater examined heart determination in Xenopus. She immediately found that the heart mesoderm is already specified by neurula stages. Heart specification is well underway by the end of gastrulation. Heart mesdoerm isolated with or without pharyngeal endoderm indicated that heart specification is complete by stage 14. The superficial endoderm is easily removed from early gastrula stages. The superficial endoderm forms the dorsal bottle cells. When these cells are removed at stage 10 (the beginning of gastrulation), all deprived embryos later formed beating hearts. It is concluded that heart specification does not require induction from superficial endoderm. Heart mesoderm is in contact with deep endoderm which may be a heart inductor. In a second paper, Sater used defect experiments that showed that dorso-lateral deep mesoderm must interact with the dorsal lip to express heart-forming potency. A review paper by Jacobson and Sater (1988, Development 104:34!-359) gives additional information about the above topics. A pdf is here .